After a couple of gorgeous ISS passes (remember, it’s “high beta angle time” again, which is explained here and here) earlier this week where I just watched (and answered questions for the neighbors, who really ought to be used to me standing out in the front yard staring at the sky), tonight I had plenty of warning, so I decided to try to photograph it again. Again, as I did about a year ago (here and here, and again, it’s no surprise that it’s almost exactly a year ago) I wanted to try using the StarStaX program to merge together a lot of short exposures into one single picture. The short reason that you need to do this is because the ISS takes several minutes to cross the sky and at the time of night that it passed tonight it was still dusk. If it where pitch black and in a dark-sky location away from city lights, then I could just take a single picture with an exposure of two to eight minutes long. 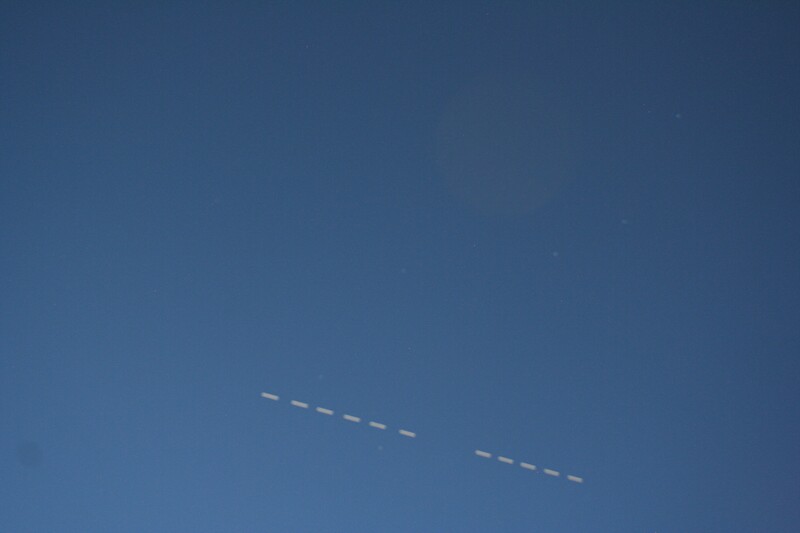 The ISS passage would be a bright white arc across the picture. With the sky still fairly bright, any exposures longer than a second or so will leave nothing but a white frame, totally overexposed. A minutes-long exposure is obviously out. But if I can take a series of exposures that are a second or so long, then “stack” them, I can show that arc across the sky as a series of segments. I was trying to shoot one-second exposures and shooting them off as fast as I could. So how did it turn out? More importantly, what did I learn for tomorrow and the next opportunity? First of all, focus the damn camera. I had the camera (Canon Rebel xTi) set on manual focus, of course, because otherwise it would try to autofocus on every picture. It would try and fail, taking several seconds, because it was looking at an “empty” sky with nothing to focus on. So I had the autofocus off, manually set the focus on infinity – and then forgot to double check it after I moved the camera around on the tripod. That was careless and stupid. 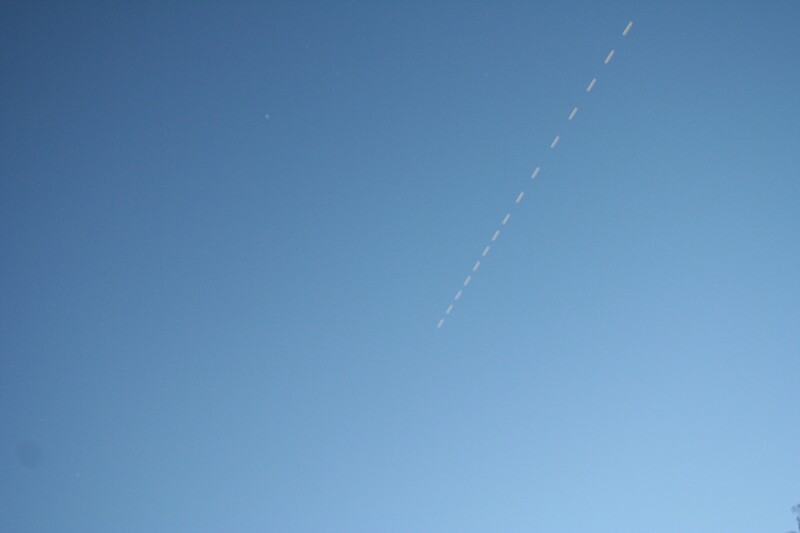 Facing south-southwest, with the sky still pretty light, the ISS was fairly high in the sky before we saw it. Here you can see the one-second exposures with a little less than a second between exposures for the camera to reset and take the next image. Near the horizon the relative motion each second is small, growing larger as it gets closer to the zenith, directly overhead. Fuzzy and out of focus as it is, in the upper left you can see another bright spot, which is Jupiter. It would have looked really cool if it had been in focus. Why is that gap there? No, the ISS didn’t teleport. I just was suddenly unable to get the camera to fire for a few seconds. What’s up with that? 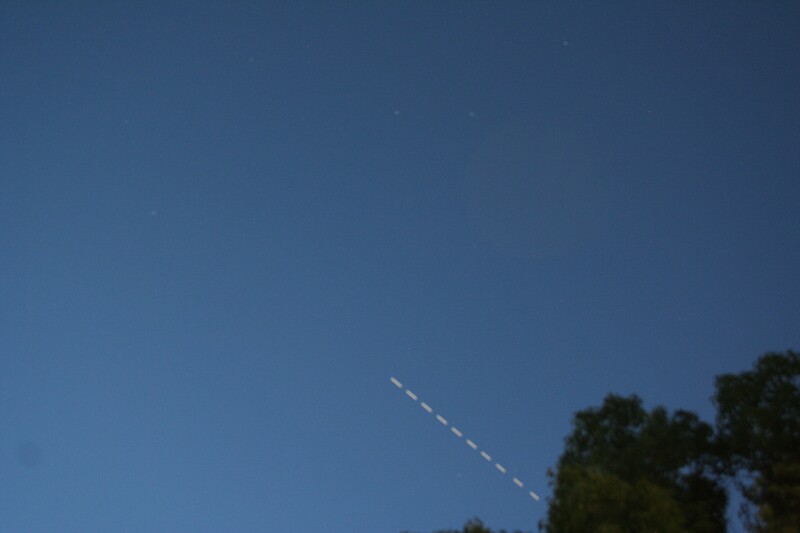 As the ISS moved past the zenith I moved the camera again, watching until it went behind that tree. Again, you can still make out the Big Dipper in the top half of the picture. Now sprint back across the street (watch out for the trash panda!) and watch the ISS head off to the northeast. There’s that stupid street light on the left (I wonder if a laser pointer could trip the light sensor on that thing and turn it off for a few minutes?) and another big gap when I couldn’t get the camera to fire for several seconds. When I came in to process these pictures and stack them, it was obvious why I had the two gaps where the camera became unresponsive. 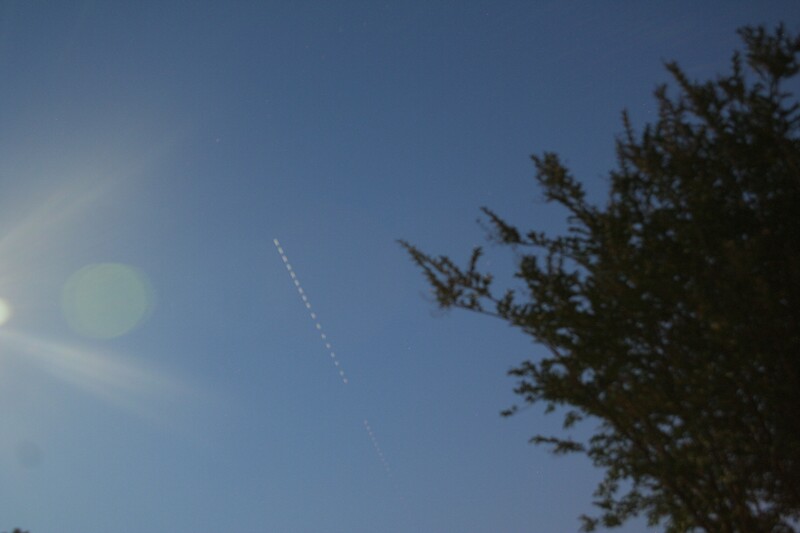 When I put the camera into full manual mode, it started saving two files for each picture. One is a JPG file, the other a CR2 (or “RAW”) file. The CR2 files are wonderful for keeping all of the image data (really good if you’re doing some fancy image processing later), while the JPG files are compressed to save space and lose some of that data fidelity. A typical JPG file is about 3.7 Mbytes, while the CRS2 files are about 11 Mbytes. With the camera trying to write files to the memory card, it can keep up if I’m shooting just JPG files. When I’m doing both and I’ve just shot 17 photos in about 25 seconds, the data transfer gets backed up and the camera stops responding. Lesson #2 then is to turn off the RAW file storage in manual mode if I’m doing this sort of a shoot. It’s wonderful if I’m doing astrophotography of a lunar eclipse, a solar eclipse, or some other event that doesn’t require a rapid-fire series of photos. Finally, given that I now know where to get really good, detailed information on the ISS passes (or a gajillion others) over on Heavens Above (really, it’s such a cool site – get a free account, use it, and maybe make a donation every now and then), I need to do a little bit more planning so I have a better idea of where things will be happening, so I can plan better to have a clear (or at least clearer) view of the horizon and sky without trees or street lights in the way. Focus. Be fast. Plan ahead. That sounds like pretty good advice for an awful lot of things, actually. There are decent passes tomorrow and Tuesday nights. Let’s see if it’s clear.